An IPSOS survey conducted in 2017 for vehicle evaluator Canadian Black Book found more than a third of would-be shoppers used online build-and-price tools and trade-in calculators. 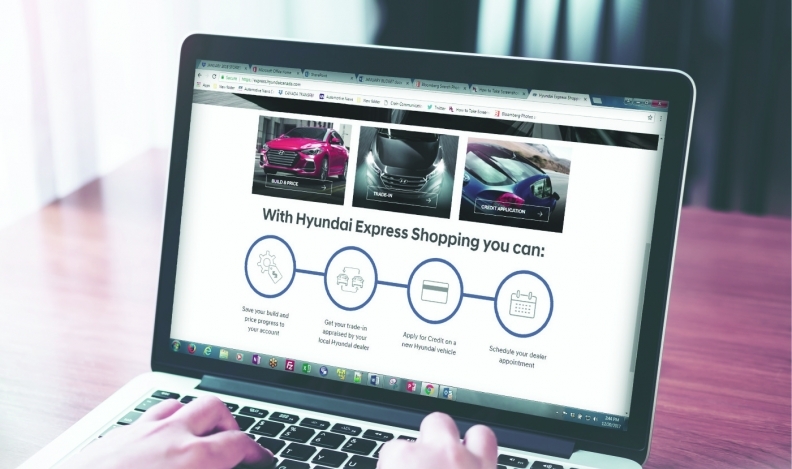 New online shopping tools are pushing more auto-sales transactions into the digital world, raising the question of whether the Internet will prove as disruptive to the car business as to other retail sectors. Depending on the automaker’s technology, shoppers can research choices, book test drives, spec out their purchase, arrange financing, get a trade-in valuation and set up delivery, all without setting foot in a showroom. That includes signing the paperwork. If home electronics, music or books are anything to go by, automakers and dealers who are slow to implement online tools are at risk of losing business. About half read reviews and while the poll did not distinguish between print and online, David Mogensen, YouTube’s head of ad marketing, noted in a 2015 post that viewing of car-review videos doubled from 2014 to 2015. Consumers clearly appreciate the time saved trudging from dealer to dealer. Buyers on average make two dealership visits, compared with a half dozen a decade ago, according to analysis of Google data, says J.P. Ostiguy, senior manager retail operations at the Alta Automotive Group of Toronto-area Nissan and Infiniti dealers. And one of those two visits likely is to pick up the new vehicle, says Ostiguy, who also consults on sales and training for other dealers and advises the Automobile Protection Association, a consumer watchdog group. It’s a time-saver for dealers, too, he said. Most shoppers show up knowing what vehicle and options they want and are well-versed in what the transaction requires. That doesn’t mean dealers can jettison staff, he said. If anything, “you need more and better Web-savvy people who can convert leads into sales, which he said takes an average of five followups. It might take several exchanges via email, social media or other means before a customer actually visits the showroom, but when they do they are more likely to buy. Conversion rates of 35 per cent are now standard, compared with 20 per cent five or six years ago, he said. “Dealership visits are way down, but the qualified people are way up,” said Ostiguy. Most automaker Web sites so far offer limited tools, which means that prospective customers are fed to dealers for followup because the dealers have the vehicles. The exception is Genesis, Hyundai’s new standalone luxury brand, which has A-to-Z online sales direct from the automaker. “The bill of sale you get is actually from Genesis Motors Canada,” said brand director Mike Ricciuto. “We own all the inventory and by doing that we are able to sell online, which was a key component of our strategy of modernizing the way people buy cars. Ricciuto says the best way to distinguish Genesis from a segment crowded with quality offerings was to provide direct sales at no-haggle prices. “Experience managers” provide test vehicles, inspect the trade-ins and deliver cars to buyers. “We want to be known as the luxury car company that comes to you,” said Ricciuto. Another approach is Canada Drives, a Web portal that allows buyers to shop for vehicles and arrange financing through as many as 300 dealers. Customers also learn for which automaker incentives, rebates or special financing they’re eligible. More than 700,000 Canadians applied for financing with Canada Drives in 2017, said Cody Green, founder and co-CEO of the Vancouver-based company. Dealers pay a fee to use the platform, they must commit to offering an array of financing options and they must assign a staff member to service Canada Drives customers, Green said. The Web provides clear benefits from a tracking and accountability standpoint, said Ostiguy. “I can really track and pin down my numbers because everything can be tracked now,” he said. It used to be a mystery how shoppers ended up in the showroom, he added.